General Practice (GP) is also known as primary care. This means that GPs are the first doctors you see when you have a problem. They are generalists who know about an overwhelmingly large variety of conditions, and are skilled in providing care in the community. This differs in many ways to the secondary care found in hospital medicine. You can learn a lot about medicine in primary care settings – here are three things I learnt from my GP work experience. Sitting the UKCAT this summer? Book your space on our one-day UKCAT (UCAT) Course! You’ve probably read in the news about GP appointment slots getting shorter and shorter, and if you’ve ever witnessed a GP surgery, you’ll understand why this is such a problem. 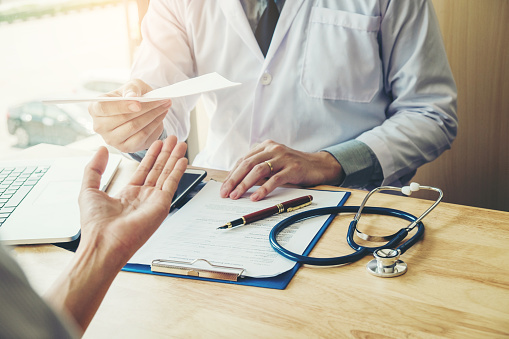 In every consultation, the doctor needs to take a full and thorough history, figure out which examination to perform, and if necessary, order tests and investigations. Throughout all of this, the doctor also needs to explain to the patient what they are doing, tell them what they think may be the problem, and explain the plan for what happens next. Some patients will also feel that a consultation is incomplete, or indeed, inadequate, without some chat about their latest life updates. All of this has to happen in 10 minutes! I realised this during my work experience, which gave me a massive respect for GPs and their time-management skills. Paperwork is a huge part of GP life. The work does not end when the patient has left the room. All history and examination findings must be documented accurately. If the patient requires a referral, then this must be typed or dictated. Letters must be written to consultants, physiotherapists, social workers, councils… and it can’t all be done immediately as the patient leaves, because there is always, of course, another patient to be seen. This means that GPs more often than not have to stay behind for hours after their last patient has left, in order to ensure that all paperwork is completed. And if the electronic records system decides to crash (not an uncommon occurrence, unfortunately) then everything must be repeated. Seeing this happen right in front of me really made me appreciate how hardworking GPs are, and also how much work is generated from each and every consultation. As a patient, it is easy to quickly judge a GP for not constantly being bright and cheery in every appointment. In my work experience, I realised just how emotionally draining some consultations can be, and how hard GPs work to appear entirely composed in the next appointment. There are not many people who are able to give someone who they’ve known for 15 years a diagnosis of terminal cancer, and then hold a normal conversation just 10 minutes later. But that is what GPs have to do on a regular basis. GPs must constantly maintain composure, no matter how they feel inside – and I was thoroughly inspired by their ability to do this. The UKCAT Course (renamed UCAT from 2019) trusted by thousands of students and hundreds of schools. Get proven strategies from an official Royal Society of Medicine partner. Wondering what kind of work experience each medical school requires? Find out on this page here!